Ethernet switches and wireless LANs are just two ways to get on the same network in most enterprises, so it makes sense to manage them together if you can. Wi-Fi grew up as a separate realm from wired networks, with different monitoring and management tools, but these worlds have started to collide in the past few years. Among other things, wireless specialist Aruba added Ethernet switches to its architecture and Meraki took administration of both network components into the cloud. Rivals Hewlett Packard Enterprise and Cisco Systems snapped up both of those companies. Now Dell has gotten into the game, not by acquisition but through a partnership with WLAN vendor Aerohive Networks. 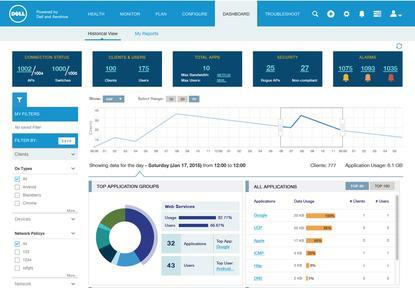 On Tuesday, the two companies are introducing a unified management tool called HiveManager NG. The system extends Aerohive’s own management software to oversee Dell’s N Series wired edge switches. With one dashboard for monitoring and configuring both, it basically turns all edge infrastructure into a single network. This simplifies management so much that it can save enterprises time and money, the vendors said. The latest generation of Wi-Fi surpasses desktop Ethernet’s typical speed of 1Gbps (bit per second), making it a central part of enterprise LANs and increasingly the main way users connect. “There comes a point when the desktop or mobile user will not need to plug in,” Dell’Oro Group analyst Chris DePuy said. The new version of Wi-Fi, called 802.11ac Wave 2, is also good business for wired network vendors. The faster speed is forcing enterprises to upgrade both their access points and the switches that feed them, using a new form of Ethernet designed just for this purpose. That's bringing wired and wireless companies together, and the Aerohive partnership is a way for Dell to play that game, DePuy said. HiveManager NG is a strictly software platform that runs in public or private clouds, so the data and controls can be reached from anywhere. Dell and Aerohive expect some large enterprises to buy the software for in-house deployment, while smaller customers will turn to public clouds. Service and support from Dell, which also will span wired and wireless, can be included in the package. Unified management can save enterprises money and time by making it easier to solve network users’ problems on the first call, said David Greene, Aerohive’s senior vice president and chief marketing officer. The HiveManager NG dashboard will let front-line tech support resolve issues more often without having to pass them on to specialists. Among other things, the system performs continuous monitoring of basic conditions like who was on the network when and whether connections were working. If a user reports a problem, that makes it easy to go back and review what was happening. When the system detects a problem, it automatically starts collecting more detailed information for diagnosis, Greene said. Dell has similar tools for managing all its wireline switches, from the data center out to the edge, but HiveManager streamlines management by adding in wireless. The companies plan to extend the software to Dell’s higher-end C series and lower-end X series switches over the course of this year and into next year.